I couldn’t believe it. 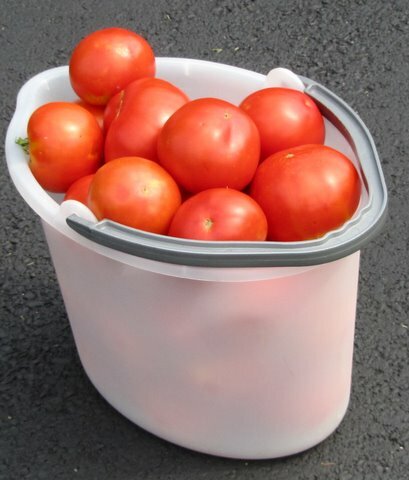 I had picked so many large red tomatoes—Celebrity, Big Beef, Biltmore, Brandywine—that I had filled two colanders and had to stack scores more of tomatoes on the nearby sidewalk. And then I put them into buckets—one large bucket and two smaller ones—to carry to the house. What was I going to do with all the tomatoes? I picked out a dozen reasonably nice ones for our daughter to take to workmates. The remainders were blemished—several of the Brandywines split after a recent rain—many others showing significant damage from stink-bug sipping. It was obviously time to pull out our big stainless-steel pot and make tomato sauce to freeze for winter. The recipe I use really isn’t a recipe. It’s “common knowledge”—at least for me—based on experience. Ingredients: ripe tomatoes, onions, garlic, olive oil, basil and thyme, and seasoning. The big chore is to prepare the tomatoes. I used to blanch them and then skin, core, and remove bad spots. Note the past tense. Last year I just washed and cored them and cut out bad spots, tossed them into a pot, and after they cooked for a while, ran them through a food mill to remove skins and returned them to the pot to continue cooking. I was ready to do that again this year, but a couple of hours before I started, I stopped at the Home & Garden Information Center to drop off a couple of diseased cucumber leaves for analysis. One of the staffers, Ria Malloy, suggested a quicker way to process the tomatoes. She suggested that after I washed them, I should puree them—skins, seeds, all except core and bad spots—in a blender and then begin cooking. Hey, I might save an hour’s work with that shortcut—and the sauce might be richer and more nutritious with the minute pieces of skin included. I did it—and admired the bright pink, frothy liquid that turned deep red as it cooked down with the onions and garlic I had sautéed in olive oil, plus some fresh basil and thyme that I added later. Even though I had squeezed some juice and gel out of the tomatoes as I cleaned them, I ended up with lots of liquid that slowly evaporated as the sauce simmered for more than three hours. I was happy with the medium-thick result that I transferred into plastic freezer cartons, but it would be even thicker if I had simmered it another hour. 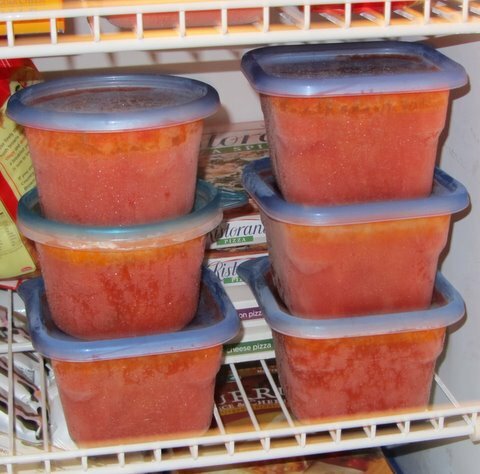 Now that the Tomato Sauce 2010 is in our freezer, I’ve just learned something on the Internet that may save me additional time when I make sauce next year: cook the tomatoes about 5 minutes after they come from the blender, and then let them cool for a half hour. The solids will float to the top, and the liquid and most of the seeds will remain on the bottom. 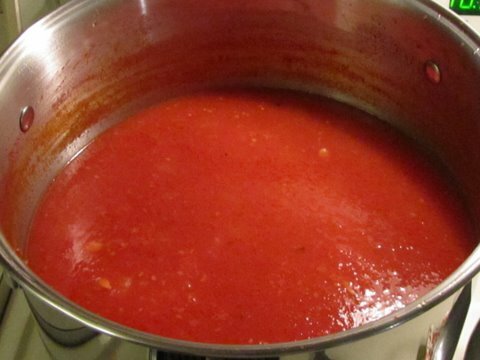 Skim off the solids—or remove the liquid with a baster—and proceed with cooking your sauce. To read that suggestion, CLICK HERE. What will I do next year? Should I remove the water from the puree with a baster—or is that too much work? Should I cook it two hours and then cook pasta in the thin sauce—or should I cook it three hours for a thicker sauce and keep cooking pasta in its own pot? Please help me decide! Post a Comment with your personal recommendations and observations. We love your blog! I'm no chef, but with 2 small children (age 2.5 and 6 mos), I kept trying more short cuts this year with great results. I throw chopped onion and garlic into the bottom of a slow cooker with olive oil and cook on high for an hour to “saute.” I then throw in my tomatoes and spices. I simply cut the tomatoes in half, remove the core and give a quick squeeze over the sink to get rid of some of the juice. I let it go on low for about 6 hours, blend it with an immersion blender to smooth it out, then crack the lid until it reaches the desired thickness. It tastes great and I love that it all is in one pot, which means less dishes and more time to play with my girls :). Great idea, Heather. I've never thought of using our slow cooker to make tomato sauce, but after reading your Comment, my question is, “Why didn't I think of this great way to make sauce?” It makes so much sense–sort of like making it the traditional way–but with so much more hands-off, so you have so much more time to care for your two small children. Thanks for sharing this great suggestion. I have some experience with your subject. Things to take in consideration to get a tick and quick tomatoes sauce are the fellow. 1. Use the right kind of tomatoes. It's not because it's a Roma than the success will be guaranty. The “Big Mama” variety has very few juice and seeds with a weight of more the 8 oz to near 12 oz each. 2. Two choice here. cut the tomatoes in pieces and boil it for 15 minutes or remove the skin, put in a boll aside for 10 minutes, use only the flesh – keep the juice in the boll- and boil for 5 minutes. I agree, Nicolas. My biggest problem is “wrong kind of tomatoes.” I really should grow Roma-type for making tomato sauce, but I don't, so I have to grabble with the “juice” issue. Thanks for you excellent list of comments.